The semester has begun here, Down Under, and that means two things. Firstly, I am teaching General Relativity from Monday onwards to our Honours class (this is my favorite course and I'll blog about it a little more, as I have a particular view of the teaching of this subject), and I have become a student again. Not the flash and manic grin, but the hair (and my understanding is that it is long, flowing female hair that is the goal, which may tell us more about those who write computer games!). No zombies or 2-d universes this weekend, as I have been busy with a few other things. This included heading to ANZ Stadium to see Australia play South Africa at rugby. 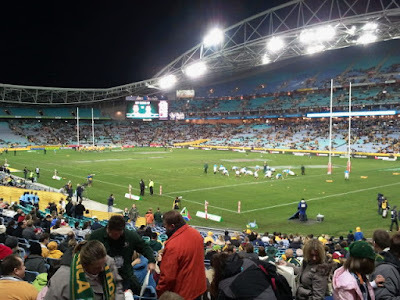 It is very easy for me to get to the stadium here in Sydney, much easier than it was to get to Arms Park when I was younger, and me and the family trundled down for the 8pm kick off. Trundling through the happy rugby cloud, we almost ended up at Acer Arena where Enrique Iglesias (whose crowd was as equally rowdy, and friendly, as the rugby crowd) was performing. It was interesting to see that also-Neath-born Katherine Jenkins will be performing there with Placido Domingo in September. After finding the stadium, we watched a good game of rugby, especially given the Wallabies woeful appearance against Samoa last week. So good, in fact, that I only caught a couple of piccies. A great week for the Conns! My ex-students, Blair Conn (who is no relation to Anthony), Richard Lane and I have just had a new paper accepted on the discovery of a Collisional Ring Galaxy at redshift z=0.111 (the most distant one known - correction, one of the most distant known). The galaxy was found serendipitously in a Subaru survey of the galactic disk and looks quite interesting. Here's two images of the system, in g-band (left) and r-band (right). Cool eh! But it looks a bit better when you combine these to make a colour picture (we can make a pretend in-between band by averaging the two pictures above). This is what you get (and is annotated as in the paper). The Slits in the image correspond to where we pointed the GMOS spectrograph on the Gemini-North telescope, allowing us to measure the velocities of the various components. It also revealed that there are active galaxies hidden down in the middle. PhD student, Anthony Conn from Macquarie University, has been working with me on measuring distances to dwarf galaxies and substructure in our nearest cosmological companion, the Andromeda Galaxy. 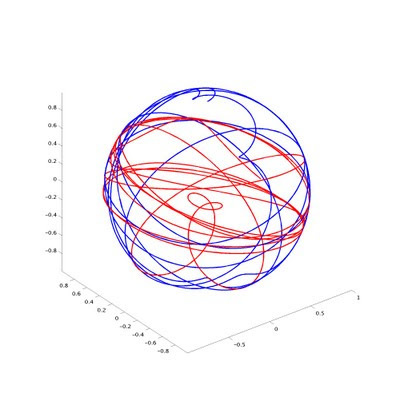 I'm very pleased to say that Anthony's first paper, using Bayesian methods to measure these distances, has now been accepted for publication in the Astrophysical Journal. Excellent result, Anthony!! Given my age, I was a young teenager when videos arrived in the UK, and horror movies were the rage. 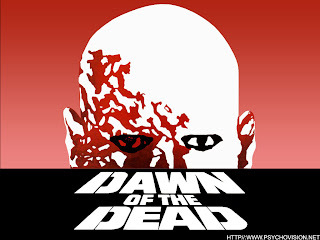 I'm pretty sure that the first zombie movie I saw was Dawn of the Dead (the original, although the recent remake wasn't that bad). Dawn is one in a long line of zombie films by George A. Romero, colloquially known as the Living Dead Series, starting with the classic Night of the Living Dead in 1968. Some of the later movies are, well, not so good, but Dawn is an excellent movie (well, excellent zombie movie). A busy day, zipping down to Melbourne for a meeting on computer infrastructure. In the meantime, I got another article published in The Conversation titled If I had a blank cheque I’d … trace the history of the Milky Way. The article is part of a series on what would happen if you give scientists a blank cheque. I was very restrained (I'd get rid of my mortgage first), and I focused on things that are actually achievable with a reasonable (rather than infinite) pot of money. WFMOS was to be the next generation multi-fibre spectrograph, built as part of a consortium between Gemini and Subaru, and to be placed at the top-end of the mighty Subaru Telescope. I've been observing at the AAT a couple of time over the last few months. It's a long drive from Sydney (almost 6 hours), for long winter nights in the dome. We were using the rather wonderful AAOmega spectrograph to chase stars in the Sagittarius Dwarf and its associated tidal stream (I'll write more about these later). I'm not much of an Astronomer, in the sense that I am pretty clueless about constellations and the names of stars (but having Google Sky on my phone is really starting to help). 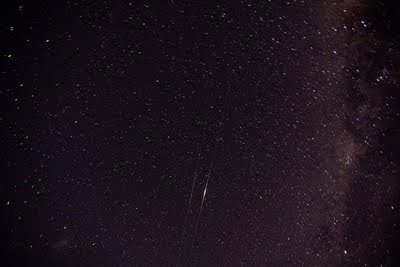 But when I am observing, I take the chance to really look up. My first observing run (in 1991) was at the William Herschel Telescope in the Canary Island, and it was the first time that I **really** saw stars, and saw that they had colours. I have a valid excuse, having grown up in the not-so-clear skies of South Wales, followed by a few years in London. Atlantis has set off on the last shuttle flight, and so I thought I would put down a few of my thoughts on the shuttle program. I was born a couple of months before Armstrong walked on the moon, and I effectively grew up expecting the Space Shuttle to change spaceflight. I don't really remember the Apollo-Soyuz link-up, but I remember Skylab flying, and then falling. I barely remember anything about the Russian space program as a child. About the time of the first shuttle flight, I sent a letter to NASA asking if they had any information about the shuttle I could have (remember, this was in the stone age when there was no internet), and I received a deluge, more packages than I can remember on the shuttle program, and its future promise. So, I have now generalized the 2-d Universe a little more, and here are two particles interacting with each other within the surface of a sphere. Cool, isn't it? So, how does one calculate such a pair of paths? As I mentioned previously, it's all standard non-Euclidean geometry and vectors and the like. So, let's go through the basics (and maths-types, please remember I am an astrophysicist and don't get grumpy about the words I use - it works :)). 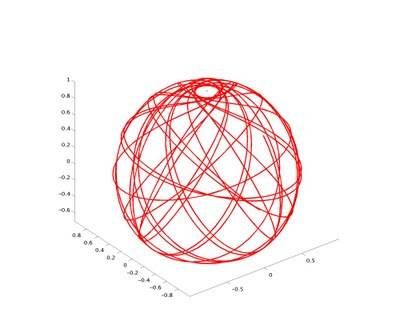 Starting point is that we are on a sphere, and so it makes sense to use spherical polar coordinates. Now, one painful thing is that different people define which angle is ϑ and which is φ, so I will be following the convention shown in the top figure on Wikipedia. Remember, however, we are working in the surface of the sphere, and so we have no radial (r) coordinate. One last post for today, as I have conquered movie making in matlab and handbrake (for small values of conquered) to make a movie of particle motion in my 2-d universe. I have softened the interaction so that it is now 1/r (which seems more sensible as we are one dimension down here). Here's the path (again, with the blue dot being the primary mass). If you said "That's a small mass orbiting a large mass in a 2-d spherical universe", then you're correct. 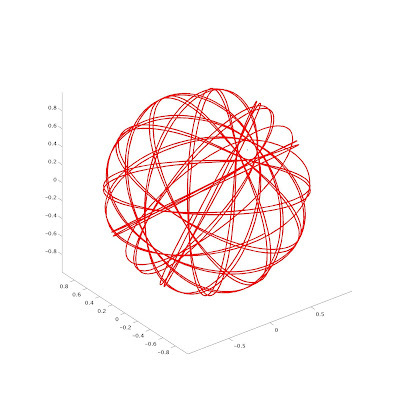 I am going to be teaching general relativity in a couple of weeks time, and every time I do I start thinking about geodesics, not just through 4-d space-time, but also standard 3-d geometry. One of the problems (IMHO) with current physics degrees is that we don't really touch on curvilinear coordinates and tensors until their final year, and (especially when it comes to general relativity), this all comes as a bit of a shock. However, we can cast much of (all of?) physics in generalized coordinates, and we should be doing this from the start, showing how things like classical mechanics can be done in Euclidean or polar coordinates (or whatever), and the key thing being that the physical predictions come out to be the same.